YOU'RE INVITED!!! 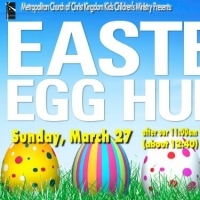 You and your family will LOVE being part of Metro's Annual Easter Egg Hunt! On Sunday, March 27, after our 11:00am Worship service, the children will search for goodies outside our meeting facility! This will be about 12:40pm. There will be prizes, Easter Eggs, a photographer to take photos, and more! It's sure to be great fun for all!